We have another layer! This time the eggs are a darker brown and we know for certain it is Elinor because she hunkers down for a while in the nesting boxes and then when she leaves there is an egg. The other one is still laying in the corner of the coop but that’s fine. Even though the eggs are a very light tan, we are now pretty sure it is Marianne, the very one we were so sure it wasn’t. We were sure it wasn’t her because she is an “Easter Egger” and her eggs are supposed to be blue or green (they can be either for this breed). But we are pretty sure the light tan eggs belong to her because she was in the coop this afternoon hunkered down in the corner for a while, came out of the coop making a lot of racket, and we looked and there was a still warm egg in the corner. Maybe as she matures the egg shells will change color? Or maybe they will always be a very light tan. No idea how this works. Today was coop cleaning day. I had all the coop doors open, removed the lower roosting pole — the Dashwoods still haven’t learned how to roost, preferring to hunker down together in their favorite corner — the nesting boxes, everything. Then I raked out all the bedding and put most of it in the compost bin but some of it in the garden under an apple tree. Then I scrubbed the coop walls and floor. During the scrubbing Elinor flew in the open egg door to see what I was doing. She walked around inspecting things and stood watching me for a bit. Then she began chattering at me, scolding me for taking so long because it was getting close to her egg time. I hurried up, got the nesting boxes back inside and she climbed right in. I didn’t have the bedding in the rest of the coop yet because Elinor was in such a hurry. I backed out and gave her a bit of privacy. A few minutes later she left the coop and I checked the nest, no egg. False alarm. So I started putting bedding in the coop. Just as I was finishing up she came in again. I closed up all the doors and let her be as I started cleaning up in the run. She came out a few minutes later. No egg. Another false alarm? Or just too much going on and she is a shy layer needing quiet? Once I was finished in the run and not doing anything around the coop at all, she went back in. She was in there a long time. I poked my head in to see what was up and she was hunkered down in one of the nests and looked at me like, “what?” It took her a while longer, but she finally laid the egg and came strolling out of the coop as though nothing had happened. Very low key our Elinor unlike Marianne. I spent a good part of the day out in the garden. The weather was partly sunny and the temperature comfortable. When they were chicks Mrs. Dashwood was my favorite and has continued to be but this week she has been supplanted by Elinor. Since we have begun allowing the Dashwoods into the main garden I have noticed that Elinor likes to come and see what I am doing. After spending time in the garden yesterday afternoon and today, Elinor has begun following me around. She has figured out that I do things that usually result in something interesting like bugs. Yesterday I was trying to pick beans and she kept coming up trying to take them from me. Today, Margaret saw Elinor following me around and decided to join us. I ended up weeding for a couple hours and the pair happily “helped” me. They went wherever I did and when I’d pull out weeds and grass they would get right down next to my hands looking for tasty morsels. And they got plenty. After I cleared a spot of weeds they would continue working the area, scratching and nibbling. Picture this, I am kneeling and bent over tugging on weeds. Elinor, nonchalant as could be, ducks under my extended arm and fits herself beneath me, watching as the roots of the weeds come up from the dirt. I can no longer see the bed because I have a big chicken right in front of me with her head down looking for bugs. I have to move over away from Elinor so I can see to grab more weeds. She comes back under my arm again as I work to watch for skittering snacks when the ground gets disturbed. While this is going on with Elinor, Margaret is standing next to my arms and has her head down by my working hands so close that I am afraid if a root suddenly snaps loose I might smack her in the face. We were all having such a lovely time of it that I was reluctant to stop even when my allergies were starting to rear up and my energy began to flag. I kept going a little longer before thanking them for their help and going indoors to take a shower. 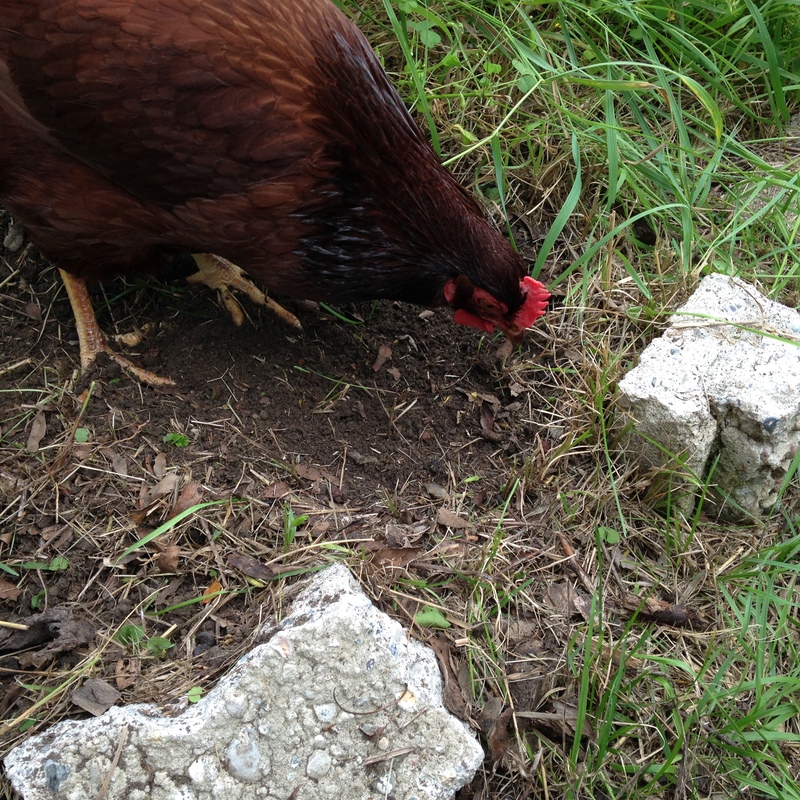 Mrs. Dashwood and Marianne kept Bookman company out in the chicken garden as he was spreading some fresh wood chips and doing a general tidy up in and around the shed. I am still picking pole beans, they just go and go! More zucchini and a few tomatoes. One of the pumpkins is turning orange and there are two cantaloupes that have made it to baseball size and will hopefully keep going. The bush peas I planted are flowering. The plants are about a hand’s length tall. They are called “Tom Thumb” so I am not certain how tall they will get. Nor and I certain how productive they will be. Flowers are a good sign that my questions will eventually be answered. A short 56 mile/96 km ride yesterday. 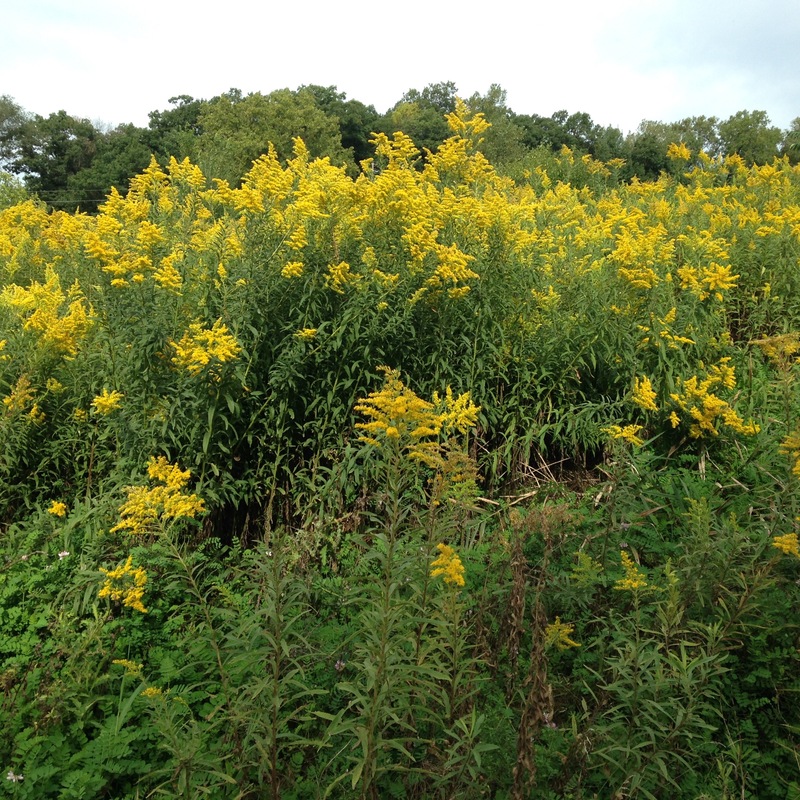 The goldenrod is blooming everywhere and the feathery sunny yellow flowers had me smiling nearly my entire ride. It was a windy day too but even the wind couldn’t make me grumpy. The one thing that did cast a shadow happened 3/4 of the way through the ride. My chain slipped off my big front ring onto the smaller one and I hadn’t even shifted it. When I tried to shift the chain back up to the big ring it wouldn’t go. I fiddled with adjusting cable tension but only succeeded in messing up my rear shifting too. Sigh. I got home fine on the gears I could use. There was nothing wrong with the derailleur that I could see, just needed adjusting. So the nice folks at the bike shop were kind enough to do a quickie for me free of charge. I love the Hub! In the spring I am going to be taking a number of bike mechanic classes so I can learn how to do all this myself. Also, I am thinking of working towards becoming a certified bike mechanic. I really enjoy fixing things and want to know how everything on Astrid works and what to do when it doesn’t. Not only will it be handy, but there might also be a future job in it somewhere. One just never knows. I loved how Elinor and Marianne decided to give you company, even at the cost of risking their own life and limbs! lol! Love reading your stories — and I have been considering bike mechanics classes as well…nothing worse than having to improvise on the far end of your course 😉 I’m glad it worked out for you this time!! bikurgurl, glad you enjoy the stories! Yeah, I hate not knowing how to fix things if they go wrong especially when I am out of a ride. I love that image of you and the hen sharing the chore though I suspect the hen got more reward than you did. BookerTalk, oh I don’t know, it certainly made the work more pleasurable! I would be delighted to weed your entire garden if I had helpers like those! Now you even have some garden helpers! 🙂 My husband also talks about taking those bike mechanic courses. I think he’s found a class in Seattle or Portland that he wants to do one of these days. The chicken stories are cracking me up. I smile reading these posts! Maybe you’ve addressed it and I missed it, but are you planning on eating the eggs? I know you are vegan, but wondering if your thoughts on the eggs coming from a known source make a difference? Also, we just moved back to Mpls and have discovered The Hub. My husband is taking their basic mechanics class and loves their set up! Glad you enjoy the chicken stories Amanda! The Dashwoods have turned out to be such a happy addition to the “family.” Good question regarding the eggs. Since they do come from a known source and since we know they are 100% organic and the chickens really are free range and they will not be killed when they get old and stop laying, we have decided that eating their eggs is ok. We tried a small bit scrambled and mixed with other things and we have made French toast and that’s it so far. Since we are used to not eating eggs they are not likely to become a regular part of our diet, more a now and then kind of thing. We would buy eggs from you. I’m being completely serious. It would be wonderful to know our eggs were coming from such happy, well cared for birds. Oh, what lovely garden helpers! (And I like the way that Elinor and Marianne’s characters conform to their literary antecedents’!) Sadly, our hens are confined to a (large) run as they tend more towards the vandal than the helper where the garden is concerned. At the moment, though, Daisy is broody and sits inside all day clucking softly. Poor Daisy! I haul her out a few times a day and dunk her bottom in a bucket of cold water (she actually seems to enjoy this) because that’s supposed to help with the broodiness though I haven’t noticed any effect whatsoever. She isn’t laying any more, but if one of the others does she nicks the egg and sits on it. Helen, it is hilarious how they all manage to fit their names so well. We have beans growing the “chicken garden” and have to keep those covered when we let them out of the run or there would be nothing left. In the main garden there is so much going on they don’t focus on just one thing and seem to prefer digging in the straw covered former potato bed and the wood chipped garden paths. If it were spring and I had lots of stuff sprouting, I would not trust them in the garden at all! Your poor Daisy. Funny how she seems like her dunking. I will happily read your chicken tales all day long… more chicken tales! 🙂 I love that they were “helping” you weed the garden. Laila, they are so much fun to have around! I hope we have a nice long fall so I can spend lots of time in the garden with them. It will be interesting to see what they do when we get snow. Poor you with your allergies, but seriously, of course you would like Elinor! How could you think of preferring anyone else! I did enjoy your report of Elinor’s nonchalant forays to the nesting box. Fascinating. 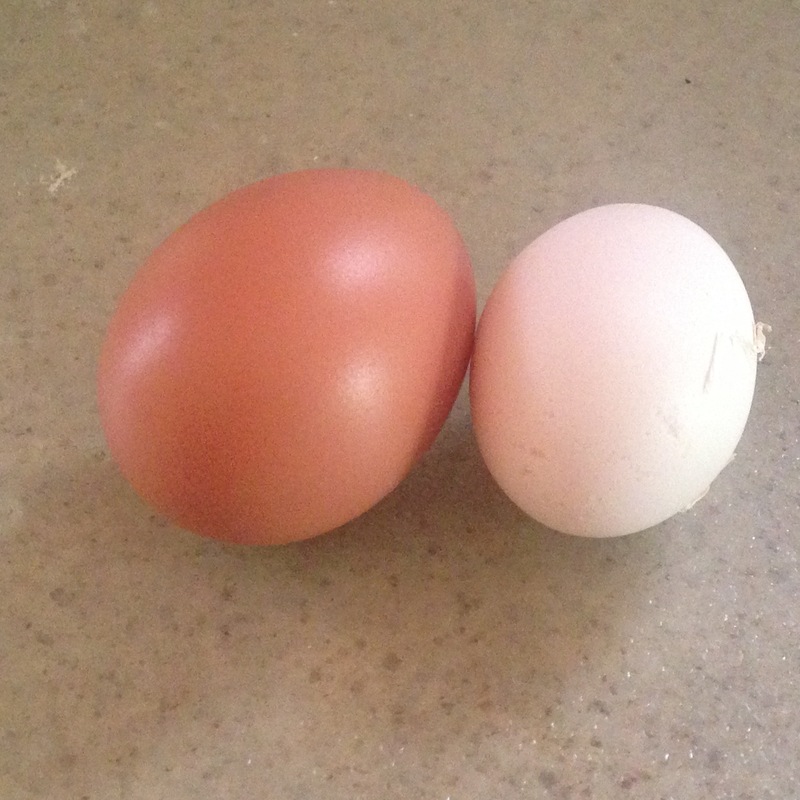 And I must say, I never knew ordinary – ok, they’re not ordinary are they, they’re yours – chooks lay blue or green eggs. I do hope Marianne does as she gets older. I want to see a pic. 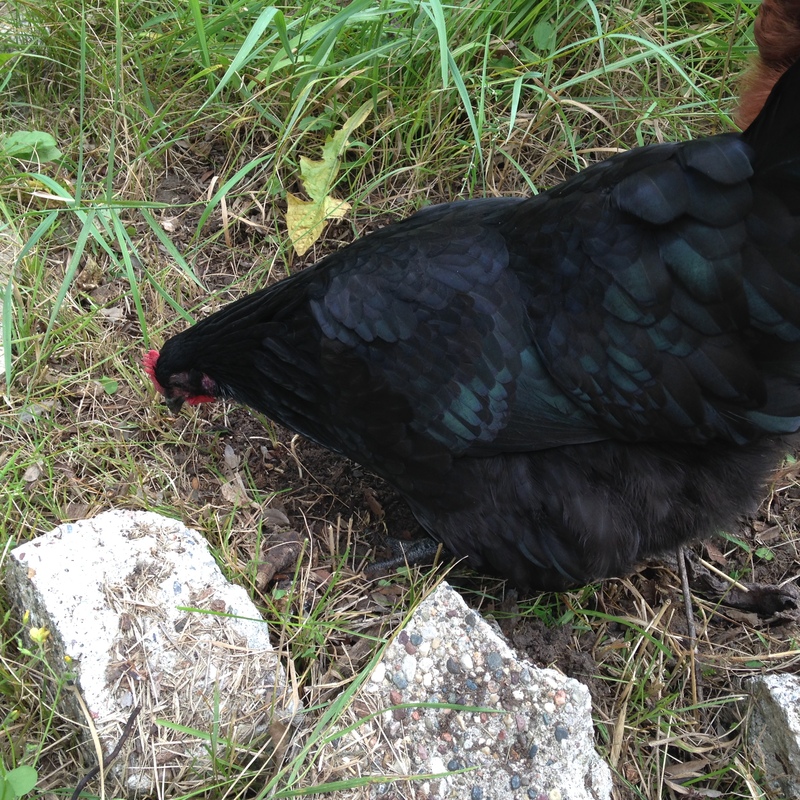 Marianne’s breed is called “Easter Egger” because they lay colored eggs. Hopefully she will, I’d like to see that! Yes, my husband lives on those anti-histamines in spring, which is starting now. Must say I wish my allergies had such treatment but no luck! Never heard of Easter eggers until you mentioned them in your blog. I live on them too from the time the snow melts until we have a couple hard frosts that kill everything so pretty much the end of March through the middle of October. Ugh. I wouldn’t wish allergies of any kind on anybody! Easter Eggers are a related to Ameracauna, a breed developed in the US from the Araucana, a breed from Chile that lays blue eggs. Easter eggers are sort of a mongrel breed that isn’t officially recognized. Thanks for the explanation re the Easter Eggers. That’s probably why I haven’t heard of them, then.